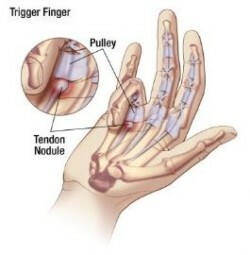 As hand therapists, we know trigger finger is a common hand issue that occurs with the locking or triggering of a finger, pain in the middle joint, and tenderness with palpation at the base of the finger. Trigger Finger commonly occurs between the ages of 55 and 60 years old and is said to occur 2-6 times more frequently in women than in men. While most are familiar with management of the symptoms of trigger finger employing or using surgery and injection, what about the use of a splint for treatment?